Projects Abroad in collaboration with 'Jajax Mexico' (the Mexican Association for Mucopolysaccharidoses and rare diseases) have covered the cost of transport for Brayan Ocampo so he can continue receiving treatment for this rare disease. Dr. Jesus Navarro Torres is Projects Abroad Mexico's medical placements supervisor and also the president of Jajax Mexico. The treatment for this disease is expensive and some of the children affected by the illness do not live in Guadalajara, which means, extra expenses in transport. This was the case of Brayan Ocampo, an amazing 10 year-old boy. He desperately wanted to continue his treatment, as this allows him to go to school, something he really loves. He lives in a town called Poncitlan, which is an hour and a half away from Guadalajara. Sadly, his family did not have the money to take him to his weekly treatment. 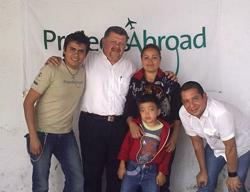 Brayan and his mother Esther and Dr. Jesus Navarro were present in the Projects Abroad Office to receive the official letter confirming the donation. Mucopolysaccharidoses (MPS disorders) are a group of rare genetic disorders caused by the deficiency of one of ten specific lysosomal enzymes, resulting in an inability to metabolize complex carbohydrates (mucopolysaccharides) into simpler molecules. The accumulation of these large, undegraded mucopolysaccharides in the cells of the body causes a number of physical symptoms and abnormalities. All the staff at Projects Abroad Mexico are thrilled that we could help Brayan in this way, thanks to Dr. Jesus for helping to arrange everything and our best wishes go out to Brayan and his family and we hope the treatment continues to improve his quality of life.